Vita Cura 5 Phase provides an instant trigger to younger looking skin. This Enzymatic Micro peel helps uncover a vibrant complexion. Two massages and a cool Spirulina Seaweed Mask with clinically proven bio-mimetic Pentapeptide firm and smooth the skin. Then skin is treated with Vita Cura Opti Lift Serum for an immediate and visible lift. Long term benefits to preserve elasticity, improve oxygenation and help promote cell renewal. The VC5 provides advance skin repair, a true alternative to surgical rejuvenation. The Derma-Peel System Facial is a two step system that gently dissolves the "glue" that holds dead skin cells on the surface layer to unveil vibrant, younger-looking skin. After a single Derma-Peel System facial it significantly improves skin texture and tone and diminishes the appearance of wrinkles. A 4 week supply of continuing treatments will be yours to take home. After 4 weeks of use, it improves skin radiance/brightness by 127%, improves skin smoothness by 97% and helps diminish the appearance of age spots. 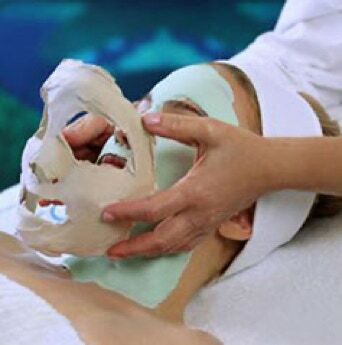 The Repêchage® Four-Layer Facial® is our Premier anti-aging treatment which Cosmopolitan UK called "...the best facial of the Century..." Experience layer upon layer of pure, fresh European seaweed to rejuvenate, tone and help firm the skin dramatically. Layer 1: Seaweed filtrate is a concentrate of freshly-harvested seaweed. It softens lines, adds moisture and helps re-balance and tone skin tissues.